In wake of an alleged Rs 11,300 crore fraud on state-run Punjab National Bank (PNB), Vice President M. Venkaiah Naidu on Monday said there was no use of blame game as the banking system in the country was going through a systemic falure. "There have to be some regulations and those regulations must work effectively. If there is a systemic failure, we have seen what will happen like in the banks. Systems have to be rectified. There is no meaning and no use of blame game," Naidu said after giving away the Prime Minister's Shram Awards to over 300 workers here. "The solution can be found only by understanding the reason behind the systemic failure and trying to correct it... Politics would go on," he said.The Vice President said that India was the economic hope of the world and that the picture was both "fascinating and complex as our economy is fast expanding". He also called for improving the education level of labour force and improving their access to quality training. "A small difference in annual productivity growth can add up to a bid difference in standards of living of a generation. It was pointed out that a productivity growth of 2 per cent per year can double the living standards in about 35 years," he said." But if productivity growth is slower, say at 1 per cent every year, it means doubling of average standards of life only every 70 years. 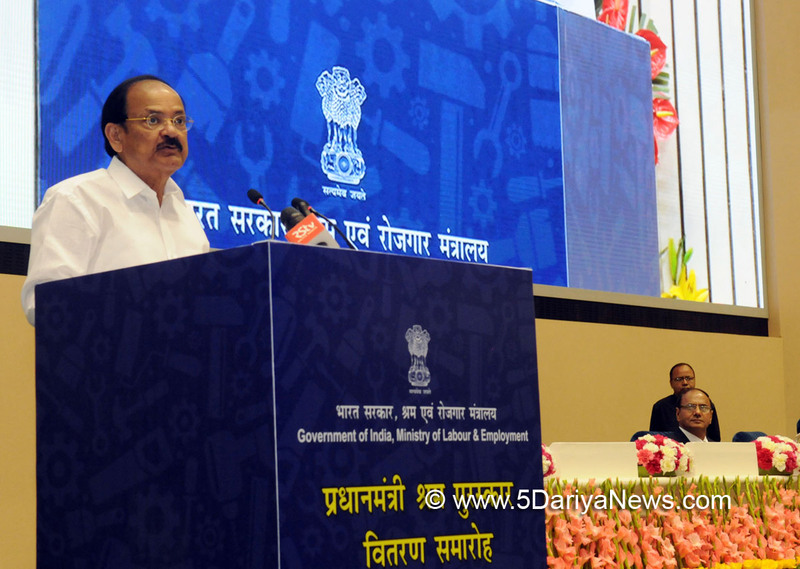 "So, it is essential that all necessary initiatives and interventions are undertaken to improve the productivity of our workforce by ensuring an enabling environment both at workplace and home," Naidu added.The Vice President also called for evolving a political consensus on reforms in labour laws. "We can not live with rules which come in the way of creating more job opportunities. Rules that make running of an enterprise difficult need to be relooked at. There is widespread acknowledgement that present labour laws are coming in the way of increased investment flows. If that is the case, should they not be examined to find solutions?" he asked.Naidu asked the government and private sector to address the concerns, needs and aspirations of the work force by ensuring an appropriate ecosystem. "At the same time, we need to create enough opportunities for those aspiring to join the ranks of workforce," he said.